This front facing, 3/4 length portrait shows emancipist convict Dr William Bland, at 49 years of age. He is posed in a room setting seated in a high-backed [cedar] arm chair with buttoned brown [leather] upholstery and scrolling foliate carved [uprights], a white [plaster] statue of a classical male figure on the left behind him, and the carved [cedar] architrave of a door or window on the right covered by an elaborately tasselled cascading curtain drapery. Perhaps commissioned as an occupational study or professional portrait, the doctor appears to be caught in act of research and writing. He holds a sharpened quill pen in his right hand, his arm resting next to a sheaf of notes on a square table with rounded corners covered in a light brown cloth with a scrolling foliate pattern, on which is set a small decorative [bronze] inkstand with an unlit candle and a pile of leather bound books – one large volume is propped upright and open to reveal an anatomical drawing of a [human] skull and the spine at the base of the neck. Dr Bland wears an eminently professional two-piece suit of plain black cloth, comprising a knee-length, double-breasted frock coat fastened to the waist with five pairs of covered domed buttons, the narrow, fitted sleeves with slit cuffs buttoning above the wrist, worn with matching trousers and a high-collared white shirt with a white neck cloth. He is clean shaven, his white hair left naturally curly, and wears no jewellery. This unsigned watercolour of emancipist convict and surgeon Dr William Bland (1789-1868) has been attributed to Richard Read Jnr (1796-1862) after comparison with others of his drawings. It has been dated between the year in which the daguerreotype portrait of Dr Bland (MIN 350) – on which this image was based – was mentioned as having been taken by George Baron Goodman (SMH 14/1/1845) and the year of its possible exhibition in Sydney in 1849 by the Society for the Promotion of Fine Arts. William Bland was a transported convict, medical practitioner and surgeon, politician, farmer and inventor in colonial New South Wales, Australia. Convicted of murder (as manslaughter) as a result of a duel in 1813, Bland was transported to Van Diemen’s Land for seven years. Later transferred to Sydney, aboard the Frederick on 14 July 1814, he was pardoned on 27 January 1815 and became the first doctor to establish a private practice in Australia. Admired ‘as much for his benevolence as for his skill’, in 1832 Bland was the first Australian surgeon to ligate the innominate artery to treat an aneurysm; his report of the procedure was only the seventh in the world. Bland was an elected as the member of the NSW Legislative Council twice (1843-1848, 1849-1850) for the City of Sydney, and appointed to the NSW Legislative Council (1858–1861) after the introduction of responsible government. In February 1846, by then a widower, Bland married his second wife Eliza Smeathman. Declared a bankrupt in 1861, Bland continued in active medical practice until his death in 1868. Another version of the Goodman daguerreotype, a lithographic drawing by William Nicholas, was published as ‘Portrait of Dr. William Bland, the philanthropist’ on 18 December 1847, in William Baker’s Heads of the people (Vol. 2, no. 10, plate facing p. 67, Q059/H). Probably produced between November 1844 and early January 1845, Dr Bland’s daguerreotype would appear to be a product of Goodman’s new studio at 49 Hunter Street, Sydney (SMH, 5/8/1844), created before the introduction of hand colouring (SMH, 9/1/1845) and before the introduction of decorative backgrounds (SMH, 25/4/1846). Stylistically, it also matches the Lawson family daguerreotypes, two of which are dated in a contemporary hand at 3/5/1845. 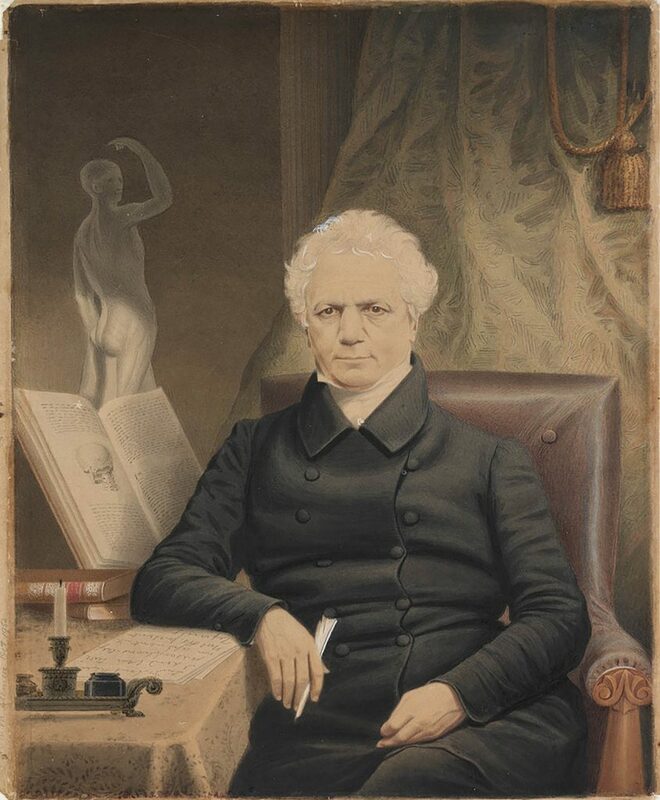 Read and Nicholas both exhibited their portraits of Dr Bland at the 1849 Society for the Promotion of Fine Arts Exhibition in Sydney, which were described as ‘staring likenesses, evidently daguerreotypish’ by the Sydney Morning Herald reviewer of 2 June 1849. Read, Richard Jnr (1796-1862) attrib. Subject is posed seated in a chair surrounded by scholarly props (ie. anatomy textbook, a sculpture, writing materials) with a lavish curtain drapery behind.